Looking for a little shade from the hot afternoon sun? Or perhaps you want a little privacy, or ‘block out’ the neighbours, or just get some nice foliage into the garden for aesthetic purposes, the easy solution is to plant evergreen trees, but which ones are best for your garden. Small Eucalypts for the garden. A fantastic addition to any garden, they provide both shade and privacy and well as protection from wind. Ornamental and dwarf varieties can be found to suit most gardens, larger specimen or feature trees are used widely in parks and gardens. Many people look for fast growing trees as a solution, however fast growing often means that the tree will large rather than small, so final size in a major determination when selecting any tree, no matter the type. Varieties including ornamental, dwarf and large growing types as well as fast growing species are an important consideration in landscaping as well as for environmental purposes. Providing shade, acting as screening trees for privacy and as shelter for other plants as well as being year round features in the garden. The trees listed all have different requirements, however all are reasonably hardy trees. The Lily pilly is a fantastic Australian Native tree that is used widely as a screening plant and in topiary. Commonly called the Willow Myrtle. 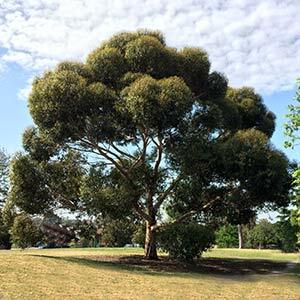 A medium sized tree growing to around 12 m. A nice weeping habit with a spreading canopy. Tolerates dry conditions and with some additional water over the first few years is a reasonably fast growing tree. Flowers: Small white slightly fragrant flowers in spring to summer. Hoop Pine a tall tree to 40m. Used widely as a shade tree or street tree in open areas. Also suitable as a windbreak. Reasonably drought tolerant and will cope well with coastal conditions. Fantastic garden specimen tree with very colorful bark and white ‘lily of the valley’ flowers. Arbutus x andrachnoides is a sterile cross so it does not produce fruit and is not invasive like some other species. A Dogwood tree, that holds it leaves in most climates but will drop leaves in colder climates. Flowers: Yellow flowers in spring followed by yellow fruits that attract birds, try not to plant this one near a pathway. Will self seed. Prefers: Full Sun to part shade. Well mulched root run to maintain moisture. Protection from frosts. Flowers: A little like ‘fried eggs’ white with yellow stamens, very attractive with a citrus fragrance. Known as the Beach hibiscus or Coastal cottonwood, will grow to 6-8m depending on conditions. Suitable for coastal plantings. Bronze foliage and a rounded spreading canopy. Moreton Bay Fig. A tall growing spreading tree suitable to very large gardens or parkland. Lovely dense dark green shiny foliage. Ficus microcarpa var. hillii or Hill’s Weeping Fig. Fast growing tree to 20m. Best suited to parklands, very large gardens or open roadside plantings. Prefers: Generally a hardy tree but prefers a hummus rich moist well drained soil. The magnolias range from very large trees to much smaller plants suitable for use as garden specimens or hedging plants. Includes; Little Gem, Exmouth, Kay Parris, Teddy Bear. Water Gum or Kanooka. Yellow perfumed flowers in summer from this spreading tree. Will grow from 7-17m depending on conditions and is used as a street tree or garden shade tree. Prefers: Full sun to light shade and does require moisture. Will grow to 8 -14m with a nice spreading canopy. Nice dark green foliage and will be deciduous or semi deciduous in colder climates. Attractive bark indwell require some water during dry periods. Used widely as a street tree. Weeping Lillypilly. Lovely tree for a moist humus rich soil. Will reach 30m in ideal conditions.